On Tuesday, Feb. 13 at 8 PM at the Parish House, the Friends of Historic New Utrecht will sponsor a President's Birthday presentation by George Washington portrayer Mike Grillo. For further information please call (718) 256-7173.
take 78 west to exit 43, Berkeley heights at end of exit make right turn and continue straight till you can't go any further. make a left turn at the McDonalds, onto Springfield avenue and continue a mile down the road. BROOKLYN - Sounds of Christmas music filled the 1892 Parish House at the New Utrecht Reformed Church in Bensonhurst as the North Shore Pops Concert Band played a combination of traditional carols, Christmas songs from Broadway shows, big-band favorites, and included an audience sing-along halfway through. The concert was free, sponsored by the Friends of Historic New Utrecht. The 33 musicians, under the direction of Eric Albinder, made their first appearance in the Brooklyn hall, which is becoming known not only for its architectural significance in the history of the borough, but also for its dazzling acoustics. The founder and conductor of the ISO Symphonic Band and music coordinator for the Friends organization, Brian P. Worsdale, sat in throughout the concert playing trombone. Founded more than 20 years ago in Glen Cove, the Pops Concert Band has become well known on Long Island and beyond as many of its musicians played in the big bands, including those of Benny Goodman, Xavier Cugat and Guy Lombardo. The New Utrecht concert also offered a touch of the Glenn Miller sound. "We hope this is just the beginning," said Robert Buonvino, president of the Friends historic organization. "We'd like to have summer concerts, outside on the church lawn (at 18th Ave. and 84th St.), maybe even in a gazebo," Buonvino added, "if funding will allow." Before the concert, the church, established in the town of New Utrecht in 1677, offered a "Living Nativity" as its annual "gift" to the community, a tradition dating back to the 1950s. A lantern hung on the stable, where people and animals presented a "manger tableau," contained a "peace light." The flame of an international peace lamp had been carried from Europe on a mission of peace and mercy started by the Austrian Broadcasting Company. The next day, Dec. 17, the church minister, the Rev. Terry Troia, spoke of the meaning of the peace light in a Sunday worship service. The concert was held in the Parish House as the church sanctuary, built in 1828 using some of the stones from the original building not far away, undergoes a $2 million repair and restoration. More information on the history of Brooklyn's earliest years is available at www.historicnewutrecht.org and by calling (718) 256-7173. The Holiday Concert took place on Saturday evening, Dec. 16, at the New Utrecht Reformed Church Parish House, with music by the North Shore Pops Concert Band. The Living Nativity, featuring farm animals and the Bethlehem Peace Light, took place Saturday, Dec. 16 in front of the New Utrecht Reformed Church. BROOKLYN - New Yorkers can help celebrate the 50th anniversary of the arrival of "Bethlehem Comes to Bensonhurst," a half-century after the first "Living Nativity" was placed on the lawn of the New Utrecht Reformed Church. While the manger scene used to be in place for a week, in recent years the live animals and costumed actors can be seen only for a few hours one day a year. On Saturday, Dec. 16, the Living Nativity will be presented near 18th Ave. and 84th St. from 3 p.m. to 6 p.m. as Christmas music fills the air. Later that day, at 8 p.m., the Friends of Historic New Utrecht has arranged for a free concert in the church Parish House by the North Shore Pops Concert Band, known for a wide repertoire of music performed by musicians including former members of famous big bands, the Benny Goodman Orchestra and the Guy Lombardo Band, among them. "Again this year," says Robert Buonvino, Friends president, "the church and other organizations, including the Boy Scouts, are able to offer this gift to the community. It's a tradition begun in 1956," the historian says, "when the church had Biblical costumes and a couple of sheep from upstate that were kept in the minister's garage. Nowadays, it's too expensive to present a Living Nativity for more than a few hours." "Yet," he added, "the church wants to maintain the tradition - as a gift to neighbors and others." 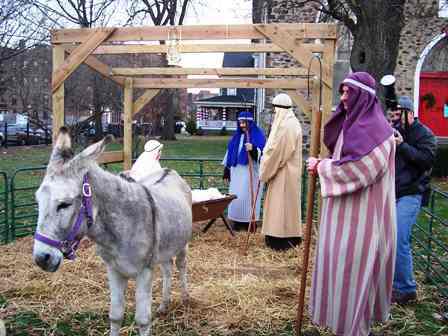 Animals placed in the manger scene in recent years include a donkey, llama and sheep. New costumes were provided two years ago by a Boy Scout working on an Eagle project. Another tradition observed at the New Utrecht site in recent years has been the lighting of an international peace lamp. In 2002, two coal miners' lamps were presented in the church sanctuary to the current minister, the Rev. Terry Troia, and to the church's Scout Troop 20, the nation's oldest. One lamp has been used in the Living Nativity and the other was given to Regina Pacis Parish, also in Brooklyn. The peace light campaign was organized by the Austrian Broadcasting Company as part of a mission for handicapped children and people in need. "Every week before Christmas, Scouts distribute the light, given from one person to another as a symbolic gift, a wish for peace and forgiving among human beings," Mr. Buonvino, a Scout leader, explained. Until Christmas 2003, the nativity scene attracted visitors from far and wide to the main church building itself, dating from 1828 and famous for its stained-glass windows, pipe organ, architecture and "little Dutch doors" leading to the pews. "Hopefully, the big red doors can be reopened in time for Christmas, 2007," Mr. Buonvino said, as a $2 million repair and restoration continues. The New Utrecht church was founded in 1677, not far from its present location. Persons interested in the earliest history of Brooklyn may call 718-256-7173 and visit www.historicnewutrecht.org. BROOKLYN - Friends of Historic New Utrecht announces its traditional holiday concert at the New Utrecht Reformed Church Saturday, Dec. 16, will feature the North Shore Pops Concert Band. Again this year, cultural and educational programs sponsored by the historic organization cannot be held in the main church building as a $2 million renovation continues to repair and restore the famous Brooklyn landmark. The concert, at 8 p.m. in the adjacent Parish House at 18th Ave. and 84th St., is free. Parking is available in the church complex, with bus and subway stops nearby. Also on the church grounds Dec. 16, the New Utrecht church is presenting its annual "Living Nativity" with live animals in a manger scene. Church members and others, including Boy Scouts, dressed in costume, participate from 3 p.m. to 6 p.m. as Christmas music fills the air. 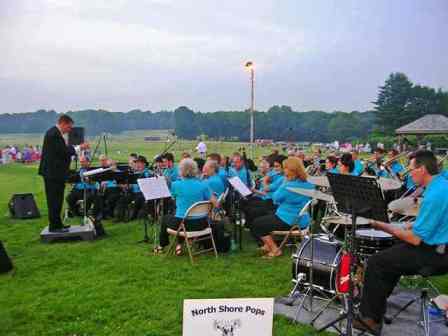 Friends president Robert Buonvino says Brian P. Worsdale, founder and conductor of the ISO Symphonic Band and music coordinator for the Friends organization, arranged for the North Shore Pops concert at the New Utrecht historic complex this year. He will join with the other musicians, many of whom are from famous big bands, including the Benny Goodman Orchestra and the Guy Lombardo Band. Begun in Glen Cove more than 20 years ago, the North Shore Pops, with Maestro Eric R. Albinder, has featured performers from Broadway shows and the New York Philharmonic as it presents lively and entertaining renditions of popular songs, Broadway show tunes, American classics and light classical favorites. At the Bensonhurst concert, Christmas songs will be "in the air." "We hope that with additional funding, we'll be able to have the main church building open in time for a Christmas concert in 2007," Mr. Buonvino said. "We also hope to be able to expand our concert program to offer a number of concerts outside, near 18th Avenue, during the year, perhaps during the summer months," he added. A historic landmark in Brooklyn, the New Utrecht Reformed Church was founded in 1677. The building being repaired dates from 1828. The Parish House where the concert is being held has its own history, famous for stained-glass windows and architecture. More information on Brooklyn's earliest years is available at www.historicnewutrecht.org.